Learn how to share passwords using Password Tote and when an opportune time to do so might occur. Sharing passwords with other people is securely facilitated by Password Tote. When sharing one or more passwords with other users, you will be able to choose permissions that will indicate how the share will be treated. You should only share passwords with those you trust because they will have access to your account credentials for the passwords you share with them. Perhaps you manage a business unit and administrate systems that require passwords for your team. You can setup the user credentials in Password Tote for each user and then share them with the respective individual. This is just one example that proves helpful when using password sharing with Password Tote. The password sharing feature is only available for Premium users, but users using the free offering of Password Tote can collect passwords that are shared with them without being Premium users. This enables Premium users to be able to share their passwords with anyone that has an email address and then new users can retrieve it by signing up for free. To begin sharing one or more passwords, select them in the password grid. Hold the multi-select key (CTRL on Windows, CMD on Mac OS) and click each password to select multiple passwords at a time. After selecting one or more passwords, there are two places where you can select to share them. Figure A shows the menu bar option beneath the Sharing item. Figure B shows the grid shortcut menu approach in the bottom right of the password grid. You will then be presented with the list of passwords you chose to share and have the ability to set the permissions per password. You can choose to use a Pin Code, which will not allow the recipient(s) to collect the shared passwords until you have delivered them the additional Pin Code. After you have set the permissions appropriately and have chosen whether or not to use a Pin Code, you can enter the email address of the person you are sharing your selected passwords with. When sending to multiple recipients use a comma between each email address. If you choose not to share the list of passwords you can click "Cancel Share". 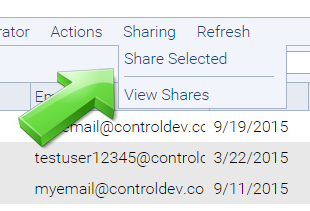 If you want to add additional passwords to the queued list of shares just click the close button in the upper right and it will allow you to select more passwords to share. One of the permissions that can be set when sharing a password is "Read Only". Setting Read Only on ensures that the individuals that you share the password with will only be able to view its contents, but not make any changes. Another permission that can be set is "Sync". When Sync is set on, then any updates you make to the password will also Sync with the users that you have shared the password with. So they will be able to see the new password if you change it or any other updated details concerning the shared password. If "Read Only" is not set on, but Sync is, then the other users you have shared the password with can also make changes and they will Sync back to your account so that you will see the updates. 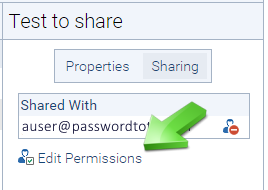 If you need to change the permissions related to a shared password then you can select the password in the password grid and click "Sharing" in the properties panel to the right of the grid. You will then be presented with a list of users included in sharing for the selected password and can manage permissions by checking the appropriate boxes for Read Only and Sync. This is done per user here and be sure to save the changes. If you no longer want to share a password with a user then the share can be revoked. This will remove the shared password from their account and the sharing connection will no longer exist. There are two ways to revoke a share. 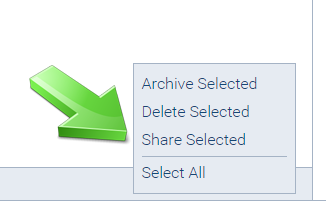 Figure A shows the revoke icon selection in the sharing properties panel for quickly revoking a share for an individual user. 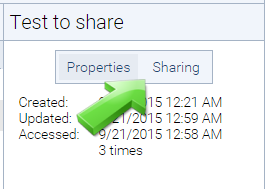 Figure B shows the grid menu item for revoking multiple shares at once using the permissions management screen. You are able to multi-select shares and choose "Revoke Selected". There is also a "Select All" option if you need to revoke all shares for a particular password. Be sure to save the changes if you revoke any shares or alter the permissions on this screen. Now we are going to cover collecting passwords that are shared with you. You will receive an email notification that a Password Tote user has shared a password with you. You can follow the link in the email or access the page to collect shared passwords by visiting your account page and choosing "Collect Shared Passwords" from the account options. You could also use the direct link to the collect shared passwords page. 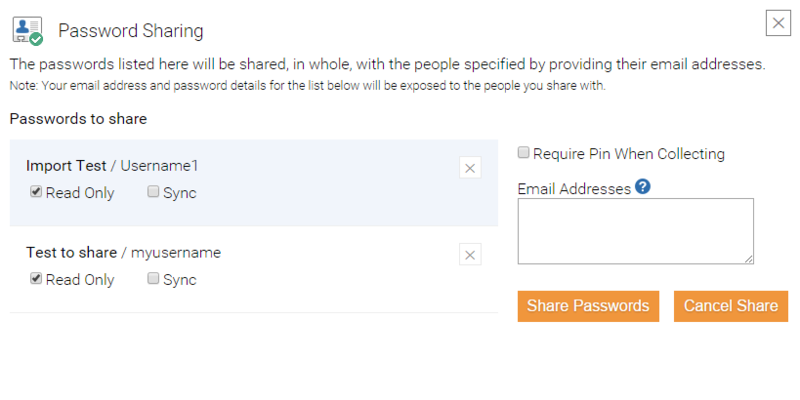 Once on the page to collect shared passwords, you will be presented with a list of any share batches that were shared to any of your verified email addresses. You can either accept or deny their invitation. Please note the password count of the batch they are sharing with you to ensure you are willing to introduce that number of passwords to your account. It is a good idea to verify all the email addresses you use with Password Tote by visiting your account page. This will ensure that as soon as someone shares a password with any of those verified email addresses that you can quickly collect them. Viewing Shared and Collected Passwords. Once you have shared some passwords or perhaps collected a few. You can filter your list to those passwords for easy management and viewing. 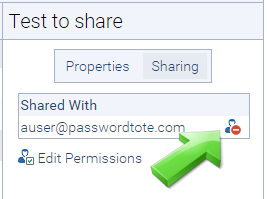 To begin, choose the "View Shares" option from the "Sharing" menu item above the password grid. Then the password grid will be filtered to the shared and collected passwords. You can then check and uncheck the "Shared" and "Collected" checks to filter accordingly. There is also an option to remove the filter once you want to go back to the complete list of passwords.